Garden of Life Sources clean, pure ingredients from organic family farms to bring you the best nutritional products in the world. 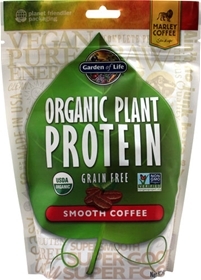 Super SMOOTH and delicious, Garden of Life's family friendly Grain Free Organic Plant Protein is packed with energy-giving protein and wholesome fiber. Mix 1 level scoop in 8 ounces of water (scoop included). Delicious with unsweetened almond or rice milk. Dairy, soy, tree nuts, added sugars, filler ingredients, artificial colors, flavors or preservatives, gluten, GMOs, grain. Other Ingredients: Certified Organic Plant Protein Blend:[Organic pea (seed), organic flax (seed), organic cranberry (seed), organic baobab (fruit), organic moringa (leaf), organic chia (seed), organic pumpkin (seed)], organic arabica coffee, organic Marley Coffee®, organic vanilla flavors, organic stevia extract (leaf), organic cinnamon, RAW Enzyme Blend: Lipase, protease, aspergillopepsin, beta-glucanase, cellulase, bromelain, phytase, lactase, papain, peptidase, pectinase, xylanase, hemicellulase, RAW Probiotic Blend: [Lactobacillus plantarum, Lactobacillus bulgaricus] 1 Billion CFU.